This salad goes really well with the Spinach Quiche, though would be great anytime you have extra zucchini. 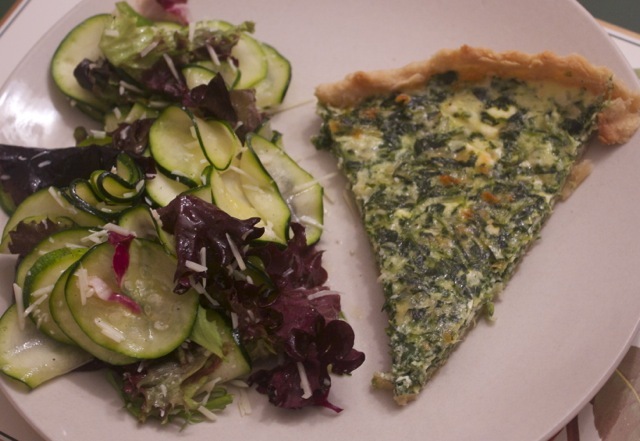 Both the quiche and salad are originally from SmittenKitchen. The salad can be made while the quiche is cooking. This is a great recipe for pulling out the mandoline, without which I think it would be hard to get the zucchini sliced thin enough. But with the mandoline, it takes only a few minutes of hands on time to quickly slice up a couple of zucchinis. Then you just throw some salt on them and let them rest for a while. Drain and dry them off and toss with parmesan, lemon juice and olive oil. Even the zucchini-disliking kids liked zucchini in this form. Cut zucchini into paper-thin rounds with a mandoline adjusted about as thin as it can be. Toss zucchini slices with one teaspoon salt in a colander set over a bowl or in the sink to drain 20 minutes. Rinse zucchini slices well, and drain. Pat dry with a clean towel or paper towels. Put greens in a large bowl. 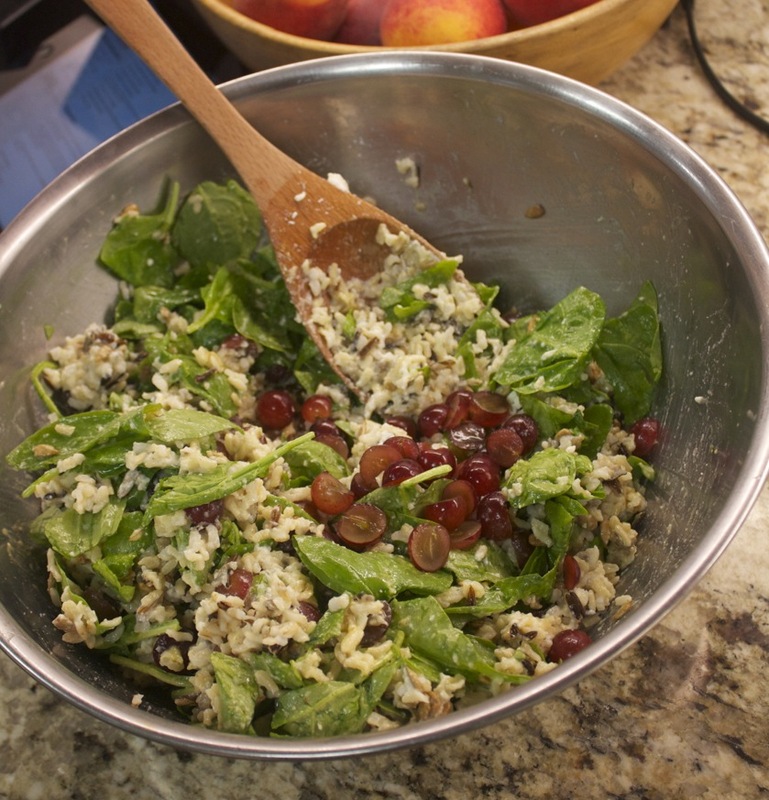 Drizzle oil and lemon juice over greens and toss. 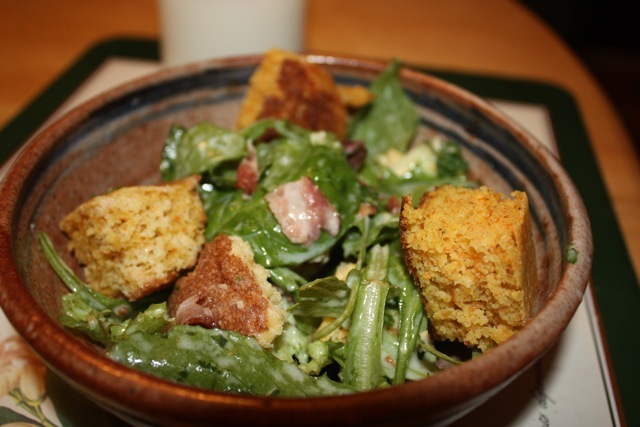 This cornbread salad recipe came from two of the sites I use a lot in planning menus, Pink Parsley and Smitten Kitchen. 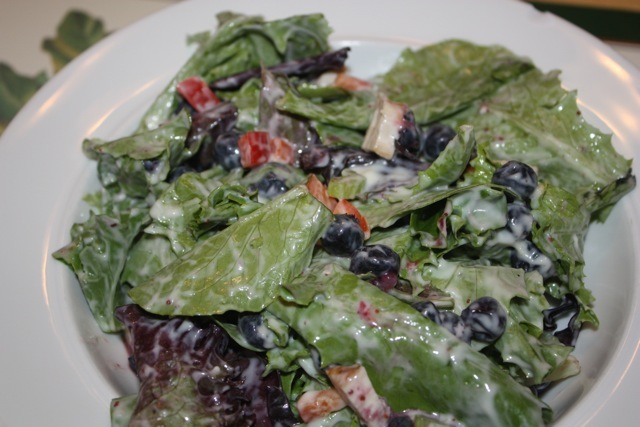 The buttermilk-lime dressing was really good, especially when soaked into a piece of cornbread! Even the cornbread recipe would be a good one to come back to–this one is all cornmeal, which I liked more than most that are usually about 1/2 regular flour. We added 1/2lb of bacon, cooked and crumbled, to make this a main course salad. 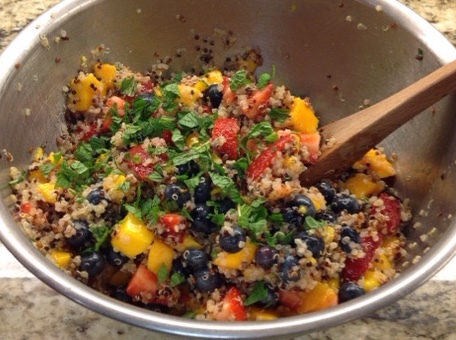 This recipe from Fine Cooking was a great refreshing summer salad. We left off the jalapeños, but otherwise followed the recipe. 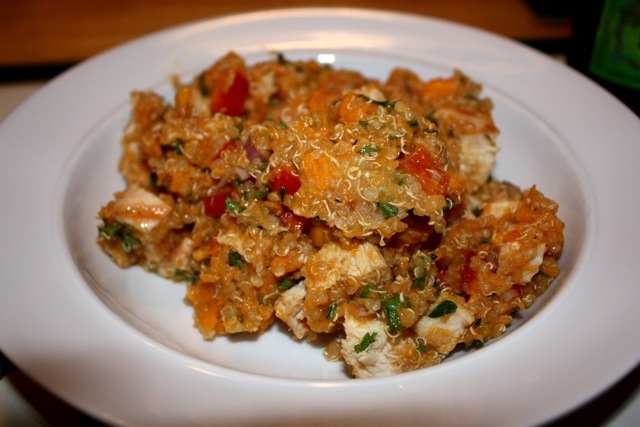 Cook the chicken, or use leftovers. Cook the rice as directed. Combine the oil, lemon juice, vinegar and sugar in a small bowl. 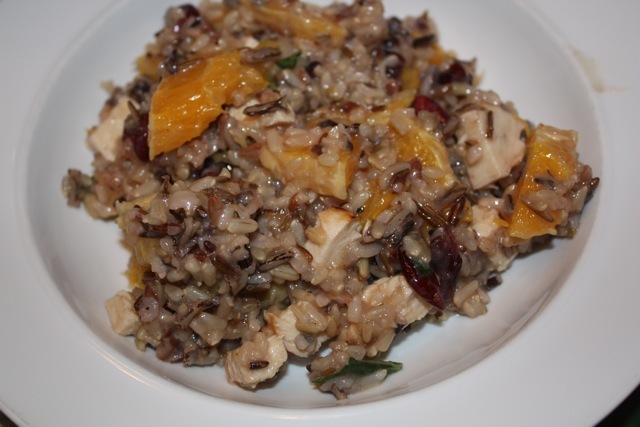 In a large bowl, mix the rice, chicken, dressing, oranges, cranberries and mint. The original called for serving this over a be of lettuce, which would be nice, but we ate it straight, which was good too. 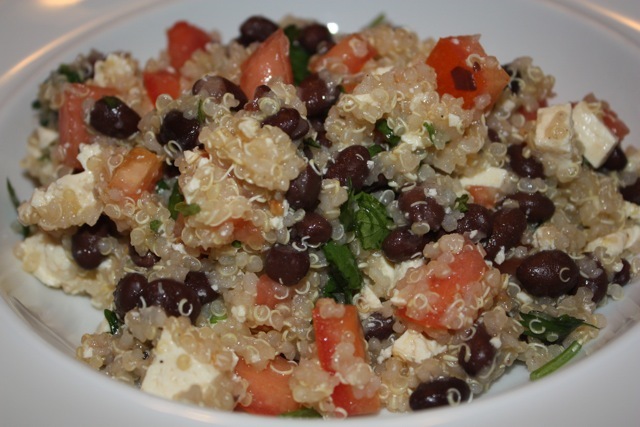 This salad from Mark Bittman is really colorful and very good. The raw shallot was a bit overpowering, so maybe reduce or cook before hand. But other than that, quite good and packed with nutrients. 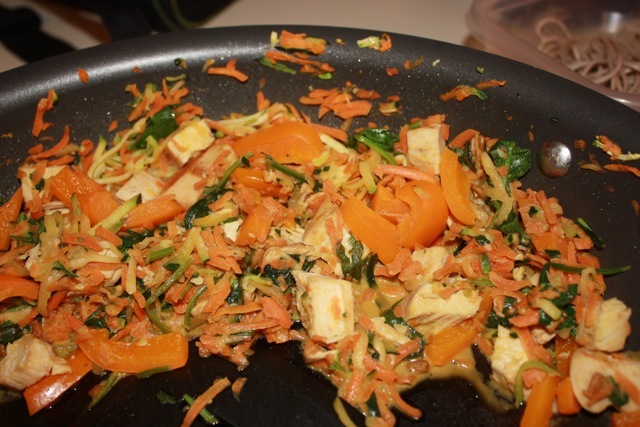 We added some diced grilled chicken breast, but could easily have left it off for a vegetarian dish.